There she was, at the back of the shop, leaning against VS Naipaul. She’d travelled so far from her native place to reach mine. That we should meet here in my hometown just as I was trying to decide where to settle felt like more than kismet or fate. It felt like my own homecoming. I reached for her. Instinctively, unhesitatingly. I knew she was here to welcome me home. For she was something familiar in an unfamiliar place. I couldn’t believe my eyes. Anita Nair was here, in Philly. But, as I reached for her, her spine strong, her pages thick but not heavy, my gaze shifted to another. A man in a mundu, standing in the rain, his face hidden under an umbrella. The Better Man. “Er. yeah. So, listen, Anita, about the book…I’m kind of on a bit of a hiatus right now. I think I still owe you a short story, actually,” I fumbled, like a student caught unaware by a teacher’s pop quiz. “I’m not talking about that. I’m talking about the story only you can write, the story not meant for public consumption, the story of your life. That story isn’t finished yet,” she smiled. My chest tightened, and tears welled in my eyes. I couldn’t breathe. “Seven dollars,” said the clerk, handing me the book and bringing me out of my reverie. I rifled through my purse for a $20 and handed it to him. As I left the Spiral Bookcase in Manayunk, I knew. I was home. I have written before about my dislike for the question, “where are you from?” For me, it hangs like a noose around my neck that tightens with every asking and every new address. Until I can no longer breathe. It was time for me to cut myself loose, to be free. I knew it. When I looked at the options for my next move, I could have chosen anywhere in the world. Many people thought and hoped I might choose India. But, I am an editor, and I doubted that anyone would pay my wages when local talent can be had for a fraction of the cost and without justifying those wages to faceless government bureaucrats. Besides, I knew that after five years abroad, that it was time for me to come home. That I needed to return to America with the knowledge I had gained outside it. I knew the time had come for me to give back and serve the country that had given me so much, the country I still believed was the best in the world, despite so much evidence to the contrary. I looked at many cities in the US. I’ve always wanted to live in Chicago again, and I think Seattle or San Francisco are great cities, even though I haven’t visited either. But, ultimately, after a free writing exercise in my trusty notebook, I chose Philly, or rather it chose me. Since announcing it, I have had this choice questioned. Even I began to question it as I took a harder look at the job market there. Had I made the wrong choice? That I happened to pick up a book about a man who returns home after a long absence was no coincidence. For Mukundan and I have been gone almost as long from our native places. That I picked up Anita Nair’s first novel, as I was finishing mine, was also no coincidence. 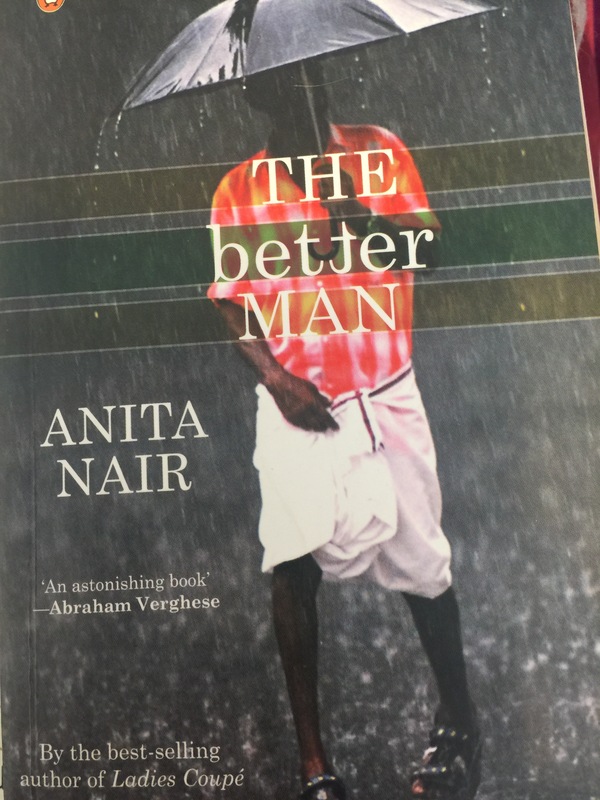 The Better Man was completed in the US, while Nair was in residence at the Virginia Center for the Creative Arts. With all these signs and symbols floating through the air, I knew. I knew this was my native place, my home town. Then, I read a piece on home towns written by Hansda Sowvendra Shekhar. In the article, he talks about the concept of home, his hometown in Jharkhand, and his attempts to make a home outside his native place. Indians have a complex sense of home that most Westerners struggle to understand. The word for hometown is often translated into English as “native place.” My friend Ritesh Kala was born and raised in Mumbai. But, if you ask him where he’s from, he will say, “Rajasthan.” That’s his native place, the place where his parents were born. That’s where he’s from. Kahan ke rehne waale ho? Where do you belong to? And, here I am with a laundry list of places so long that I once used an Excel spreadsheet to count the moves. They number more than 20. In The Better Man, Mukundan Nair struggles with this question. In his struggle to belong, he alienates those closest to him at the moment when he needs them most. Life, it seems is not without a sense of irony, as Morpheus says in the Matrix. Perhaps that analogy is apt here. For just as Neo’s trip into the Matrix is a disorienting journey into a world he recognizes but does not know, so, too, is Mukundan’s journey back to Kaikurussi. His journey is a paradoxical exploration into a world that has moved both too slow and too fast. That is my journey, too. A journey into a world where little has changed, where time feels frozen among lush green oaks and perfectly manicured lawns, and yet where time has also shifted so dramatically that I do not recognize the landscape. Especially the political landscape. That shift that feels so cataclysmic to us now, so apocalyptic, has been going on for some time. Hidden deep within a paragraph about the Babri Masjid is the phrase “Go across to Pakistan.” A 20-year-old novel holds within its pages a phrase that the right in India now throws around with so little thought that it has practically become a catch phrase. These alt-right shifts we see in India, the US, and across the world have been quietly sliding, realigning the political tectonic plates right under our feet. Yet we have failed to feel it, and to heed the warnings our technology has given us. It is in this place that I feel a sense of loss. The loss of belonging to a place, which I no longer call home. It is in this place that I feel a call to another, more distant, yet less foreign, place. My time in Philly was one of manic energy and joy, where my time here has been one of depression and sorrow. When I walked down Philly’s Chestnut Street during my weekend at Penn, I knew. I was home. While there, I ate an everything bagel with salmon cream cheese at the Spread Bagelry, and I felt like I belonged. Perhaps that’s why I re-created that food this past week. I made the salmon cream cheese myself, even though store-bought versions are readily available. That food and its creation were my connection to a time and a place where I belonged. Where I could answer that question with confidence, not hesitation, for once. Where I could be The Better (Wo)Man in my hometown. Be like this only Jean and keep on teaching us how to write so seamlessly. Respect. I love it when people use that phrase. It’s one of my favorites. Thank you. I will keep writing.